A handheld hard disk duplicator from Greystone Peripherals, a subsidiary of PubliCard Corp. of Fairfield, Conn., transfers 400 megabytes per minute in either direction between dissimilar PC drives and operating systems. Company representatives say the $895 D-101 unit has users in the FBI, CIA, NASA and Army and at several sheriff's departments. The device can transfer data through a PC's IDE interface or parallel port and comes equipped with a cooling fan to prevent the hard drives from overheating during transfers.  Remap, to recover data from bad clusters. 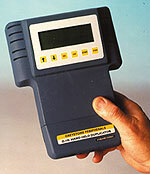 More information about the D-101 appears on the Web at www.publicard.com and www.grystone.com.